There is a rather different version by Osho (aka Bhagwan Shree Rajneesh) which I think may be the earliest one. It can be found here. This is a story that (I presume) Osho made up — something he was prone to doing. It’s not from the Buddhist scriptures. The Buddha did use different language and different spiritual models depending on his audience. So when talking to monks he would talk in terms of the spiritual goal being nibbana, or liberation from the rounds of rebirth. When talking with householders he was more likely to talk in terms of being reborn in heaven and avoiding hell. What were his views on God, or gods, we should say, since he lived and taught in a polytheistic society? First, the Buddha’s teaching is incompatible with an eternal, omnipotent God, and he thought such a belief to be spiritually harmful, since it diminishes our sense of personal responsibility. He did often talk as if gods such as Brahma existed, and described conversations with them. In these stories Brahma frequently comes off as a buffoon, and I think we can safely take such stories to be satirical in intent. In one such story (in the Brahmajala Sutta) he pokes fun at Brahma as having deluded himself into thinking that he was the creator of everything. In another sutta he described Baka Brahma as “immersed in ignorance” for believing himself and his heaven as being permanent and said that the Brahma and his entire retinue were under the sway of Mara (roughly the Buddhist equivalent of the devil). Toward the end of the Kevaddha Sutta the Buddha recounts an episode in which Brahma confessed to being afraid of the other gods’ reaction if they discovered that he couldn’t answer questions put to him by one of the Buddha’s disciples — questions that the Buddha was able to answer. Let the wilderness serve for your seat and bed! Go about set free from the ties that bind. Mindful, with guarded faculties — and wise. 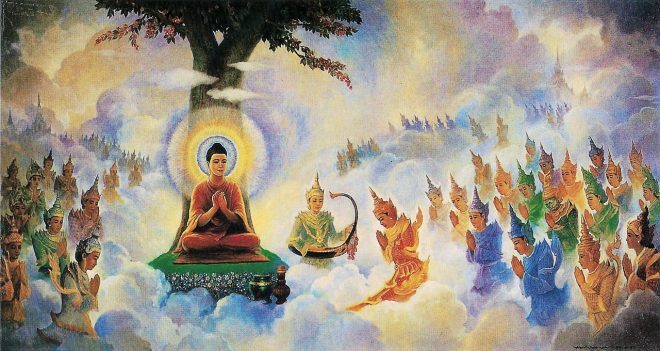 Sometimes gods came to the Buddha as disciples, and heard teachings from him. Sometimes they gave teachings to monks. There are always going to be some people who will be annoyed by me saying this but my sense is that the Buddha did not believe in gods, and that his stories involving them were either satirical or poetic. This particular story, however, was not one he told. The broken English (“If I’m not having anything?”) suggests that it was written by someone in India. With a little literary polishing it would make a fine Hallmark card to give to your Buddhist friends on Wesak, but it’s not something that’s from the scriptures. In fact this little fable seems to be brand new; I haven’t found any instances of it on the web earlier than 2013. So far it doesn’t seem to have made it into any books, although surely that’s just a matter of time, since I’ve seen this appearing in a post by the well-known Western Buddhist teacher Lama Surya Das, for example. There’s nothing at all un-Buddhist about the advice given here, although I don’t recall the Buddha having described the practice of giving in such a way. There are these two kinds of gifts: a gift of material things and a gift of the Dhamma. Of the two, this is supreme: a gift of the Dhamma. Householders were typically expected to give material things in order to support the monastics. Monastics were expected to give the Dhamma, in order to spiritually support the householders. He never, as far as I know, talked of smiling, praise, etc., as forms of giving. These, monks, are seven forms of wealth. with discernment (paññā) as the seventh form of wealth. Since in the Buddha’s view wealth had to be shared in order that it be legitimized, there’s an implication that these seven things (the last of which would correspond to the giving of Dhamma) are forms of giving. If we take the sutta references I’ve given above, we can see that the Mahāyāna teaching is simply a systematization and clarification of what the Buddha taught. So, once again, the message in our fake quotation is very Buddhist in content, but it’s not a scriptural quotation and isn’t a genuine quote from the Buddha. It’s more akin to the teaching technique of creative storytelling that I’ve discussed elsewhere. This can be a valid form of teaching, but in this instance we’re not even talking about a paraphrase of something the Buddha’s recorded as saying, but something entirely invented. It’s rather a long passage so I’ll let you read the rest on the original site. The first five (of seven) forms of giving that are listed here correspond exactly to the five in our suspect quote, so I’m reasonably confident it’s an adaptation and condensation of the teaching by Dharma Master Cheng Yen, unless of course both are based on a source that I haven’t yet tracked down. I only recently started seeing this one doing the rounds, and at first I ignored it, because it was so obviously fake that I didn’t think anyone would take it seriously, any more than they would think that the Dalai Lama really had gone to a hot dog vendor and asked him to make him one with everything. And yet, it seems some people really do think that this play on words really is a conversation from some Buddhist scripture. It ain’t. So there’s no separate word for “I” that we can remove from whatever verb would represent “want” (it might be the verb kāmeti, to desire). We’d have to remove “I” and “want” at the same time, since they’re inseparable. And maybe that’s a more Buddhist teaching, since in Buddhism the problem with our sense of personal identity is that we cling to it.. The Buddha didn’t eradicate references to himself from his speech, but he made it clear that there was nothing that he clung to as part of his sense of self. We get rid of the problem of the self by ceasing to cling to the self. The clinging and the clinging to self vanish simultaneously. I’ve no idea where this quote originated. I’m assuming that someone was making a little Buddhist-themed joke rather than trying to claim that this is actually a canonical quote, but I haven’t, so far, managed to find a source. Or at least not an original one. Anyway, it would be silly for me to take this little pun too seriously. I only decided to write it up because so many people have been concerned about people who seem to think it might be a genuine scriptural quote. If you’re one of those people, I have the address of the Dalai Lama’s hot dog vendor, if you’re interested. But be warned, you have to have the exact money, because he can’t issue change. Change, after all, comes from within. This one seems to be doing the rounds at the moment. This is an awkward one, because nothing the Buddha says is actually inaccurate. After all, he says “no” a lot and then says he’s awake. None of those things is a misquote. And the dialogue kinda sorta happened, but not in the terms used in the quote — but that’s what makes it suspect, because the Buddha’s words have been put in a new, and inconguous, context. 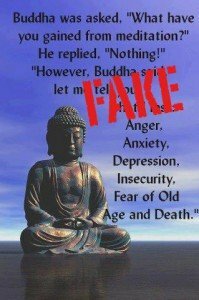 I’ve done a lot of truncating here, so that the relevant portions of the sutta and the Fake Buddha Quote can be contrasted more easily. First, who is this “Dona” who is talking to the Buddha? 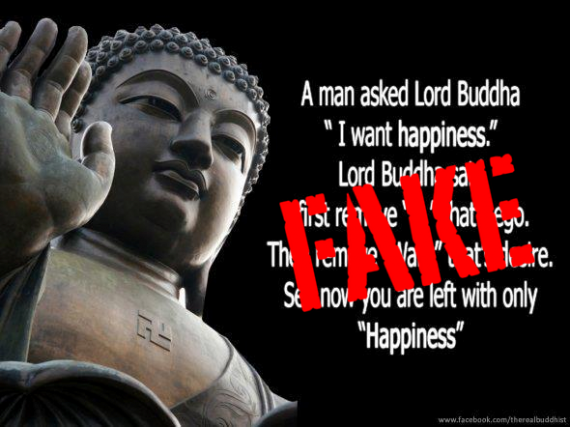 It’s not a “student” of the Buddha, as is stated in the Fake Buddha Quote. It’s a brahmin priest who has seen the miraculous footprints of the Buddha, complete with wheels of 1000 spokes, and who follows the Buddha to question him. And then there are the categories used in both the fake quote and the sutta. In the fake quote the first category into which Dona tries to pigeonhole the Buddha is “Messiah.” This is very inappropriate language, and in fact it’s straight from the New Testament, Matthew 11:3. Dona of course doesn’t ask whether the Buddha is the long-awaited savior of the Jews, or if we are to take the term Messiah in its more popular sense, does he ask if the Buddha is a savior of any sort at all. He merely asks if the Buddha is a divine being. Dona, of course, is not a Buddhist, so he wouldn’t have had a Buddhist understanding of the term “deva.” Devas (gods) in Buddhism are not immortal or spiritually awakened beings. They live mortal lives, although on a vastly longer timescale than our own. And although they may have greater powers than us, those powers are not in a Buddhist sense spiritual. They have no insight. They are not awakened, as the Buddha is. Dona would not have seen the gods this way. Presumably he would have seen them as immortal and spiritually magnificent beings. So the Buddha rules this out. No, he is not a god. I think we can safely assume that in Dona’s mind the terms deva, gandabbha, yakkha, and human being represent progressively less exalted kinds of beings. Nor does Dona ask the Buddha if he is a healer or a teacher. He’s simply concerned with whether the Buddha is a divine being or a human being. He doesn’t ask about the Buddha in terms of being a teacher or healer. Dona finally tries asking the Buddha if he could be described using a non-divine category — a human being. The Buddha denies that he is this. So while something like this dialogue is recorded in the Buddhist scriptures, the terms have been changed a lot, and so I’m going to regard this as a Fake Buddha Quote. But let’s take a moment to go back to the sutta. The Buddha not only denies that he is a devine being, but he says in effect that he is indefinable. He’s not even definable as a human being. Brahman, the āsavas [negative mental states] by which — if they were not abandoned — I would be a deva: Those are abandoned by me, their root destroyed, made like a palmyra stump, deprived of the conditions of development, not destined for future arising. The āsavas by which — if they were not abandoned — I would be a gandhabba… a yakkha… a human being: Those are abandoned by me, their root destroyed, made like a palmyra stump, deprived of the conditions of development, not destined for future arising. There are various ways to interpret this. Here’s how I see it. The āsavas are the basis of our clinging and of, therefore, our self-view, which is just one particular form of clinging. The Buddha has no clinging, because the āsavas have been destroyed. Therefore the Buddha does not identify anything (body, mind, etc.) as being “his self.” The Buddha lacks any theory of or idea about his own self, and lives without reference to a self. He doesn’t define himself. In fact it’s because he’s a Buddha that he doesn’t define himself. And so, the Buddha is essentially undefinable. 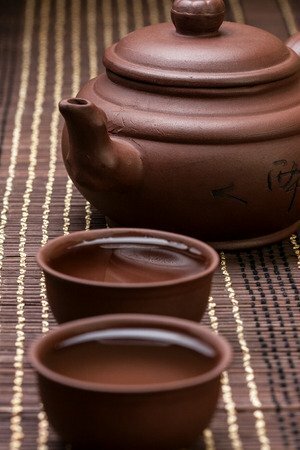 Those of us who are not Buddhas can certainly try to pigeonhole him into one of the categories we use, but these categories don’t match up with how the Buddha sees himself, which is certainly not in terms of any of those categories, or indeed in terms of any category we could imagine. The Buddha’s view of himself is — and I step out of traditional language here — a direct perception of an indefinable “flow” or “process.” This process is not perceived as being separate from the world, or as being part of a “oneness” with the world. This is often taken to mean that the Buddha only has one purpose, which is to teach suffering and how to end it, but it’s clear from other suttas that what the Buddha is saying is that suffering and the end of suffering can exist, without there being a “self” to experience either suffering or its end.